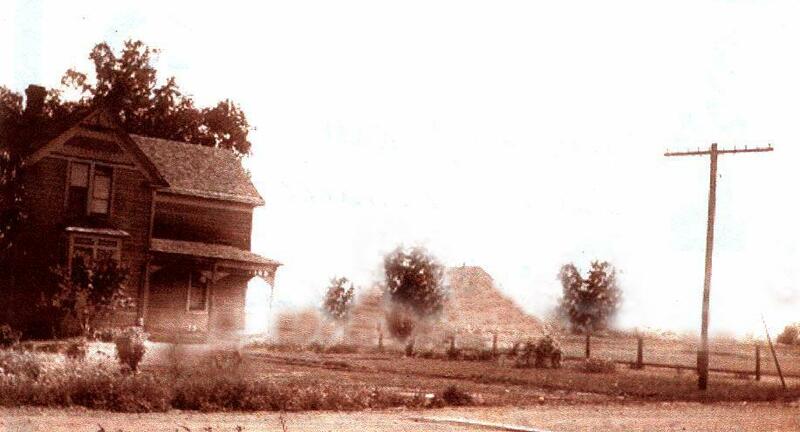 YESTERDAY – George Romrell house at 253 4th Street; mound in the background; photo courtesy of Lee Romrell, c. 1900. TODAY – George Romrell House, 253 4th Street, built 1890; photo Feb. 2011. George Romrell was born on the Isle of Jersey Oct. 14, 1832 the son of Francis and Mary Romeril (Romrell). He joined the Church of Jesus Christ of Latter-day Saints in 1849 and came to America in 1851. He lived in St. Louis ten years and then came to Utah in 1861, crossing the plains with an ox team. While crossing the plains he met Patience Swingewood and married her one week after arriving at his father’s house on 2nd Street. George and Patience spent the first winter of their marriage in a dug-out house; they had a quilt for a door and a sack at the window. They worked industriously for years and saved money to purchase land in the Fourth Street area. Early in their marriage Patience decided they must overcome their habit of drinking tea. She kept making it weaker until they were drinking hot water with cream and sugar. Daily family prayer and evening reading of the Book of Mormon was their practice. As their 12 children learned to read they gathered around the table in the evenings and took turns reading a few verses of scripture aloud, and their father would explain the truths of the gospel. 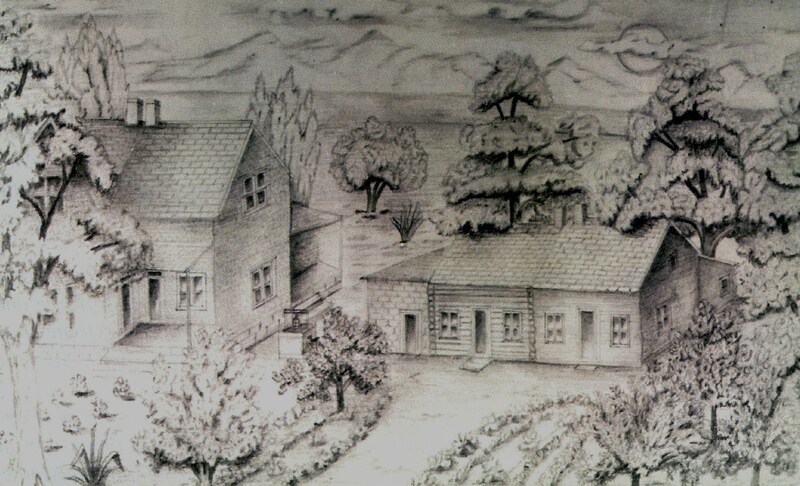 Drawing of George Romrell log cabin (center) and additions on the left and right; subsequent house (left) once stood on the SW corner of today’s Washington Blvd and 4th St.
After the dug out house George built a log cabin and later made several additions to the cabin. The above drawing depicts the gradual expansion from cabin to cabin-with-additions and finally to a new brick house on the southwest corner of Washington and Fourth Street in 1886. At the time of building the brick house in 1886, George’s son Joseph worked in the Gates’ Adobe Mill and Brick Yard on 2nd Street; it is likely that George bought his bricks there. In 1890 there was a land boom in Five Points and George sold the above houses pictured in the drawing and 15 acres of his land on Washington and Fourth for a good price and built another house at 253 Fourth Street near the lower Lynne Ditch. 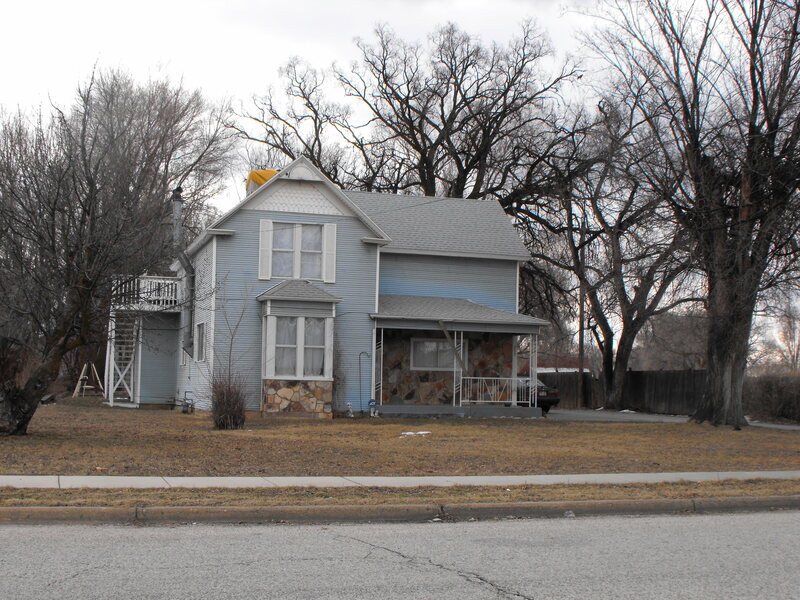 This was his final house and is still standing next to the park and Clark’s Hill. George Romrell’s farm land later became part of the 4th Street Park, and in 1979 the park was renamed Romrell Park to honor the pioneer heritage and the Romrell family. YESTERDAY: The last house of George Romrell at 253 4th St., 1890. 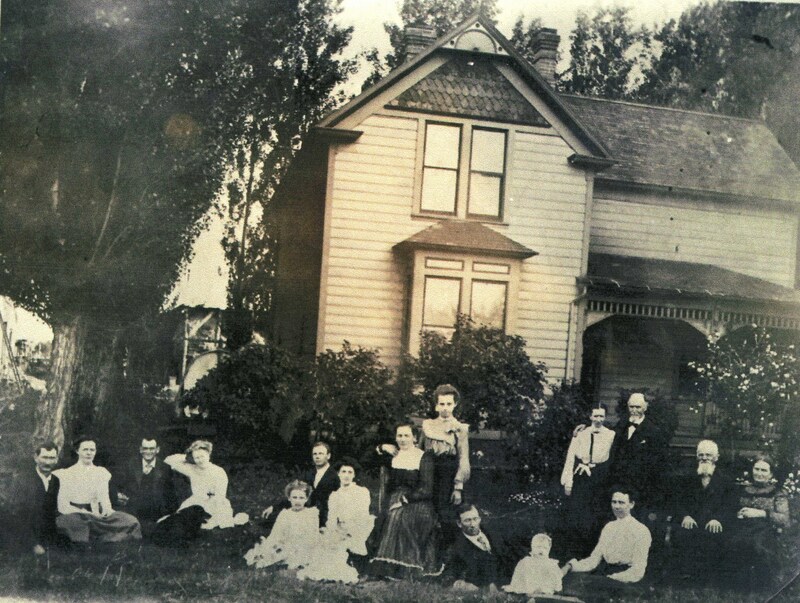 L to R: Joseph and Della Romrell, Hyrum and Ruby Romrell, Lettie Ossman, Lorenzo Romrell, Josephine, Elizabeth Ossman seated and Leona Ossman standing; Oley C. Oleson reclining on grass with Fannie and baby Leona between them; standing toward the right in back of Fannie is Patience’s sister Myra Swingewood and her husband Charles Neal; seated on the extreme right are George and Patience Swingewood Romrell; photo courtesy Lee Romrell. 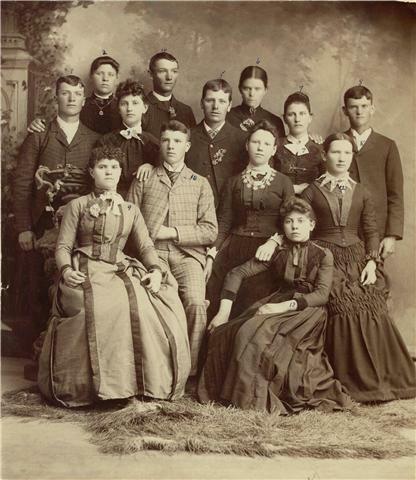 Romrell cousins; some of the children of George and his sisters Jane (Pierce) and Fanny (Ducloux Singleton); circa 1880. Photo courtesy Lee Romrell. George Romrell obituary, Standard Examiner, Jan.1913. Gwen Burgin, George Romrell, adapted from History of George Romrell by Lettie O. Hatch, manuscript, p.1, 2; Parley Oleson, ROMRELL PARK, A Reminder of Ogden’s Pioneer Heritage, manuscript, 1999, p.1, 2. Gwen Burgin, George Romrell, p. 2. Drawing by Fanny Romrell Oleson, published in One Thread Just Passing Through, by LaNett Oleson Ward, 1999, p. 130. Nina Bowman, Joseph Romrell, p.274. Parley Oleson, ROMRELL PARK, A Reminder of Ogden’s Pioneer Heritage, p. 2. City Favors Naming Park to Honor Family, Standard Examiner, March 21, 1979; FOR ROMRELL PIONEERS, 4th Street Park Renamed, Standard Examiner, April 7, 1979.